Working on the Crewel Rooster project, I’ve had the opportunity to play around with seven different crewel wools currently on the market. 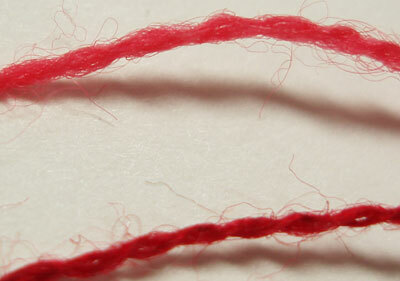 Today, I want to show you those threads up close – just the threads. In looking at just the threads, though, out of context, I will admit there’s not a lot to learn from them. You might get an idea of their structure, but other than that, you can’t tell much from them unless you see them in context, in stitching. That’s the way I see it, anyway! So my plan – and I’m slowly working on it – is to show you some stitch samples with each of these threads, and to put the samples side-by-side so that you can see them and compare the outcome of the stitching with the various threads. In the meantime, though, let’s look at the seven different threads I’ve been working with. These are the threads I used, in alphabetical order: Appleton crewel (100% wool from England), Bella Lusso (100% merino wool from Italy), D’Aubusson (100% wool from France), Gumnuts Poppies (a 50/50 silk/wool blend, from Australia), Heathway (100% merino wool from Wales), Renaissance Dyeing crewel wool (100% merino wool, vegetable dyed, from France, but the wool is from England), and Simply Wool by Gentle Art (100% wool – company is located in the US, but I don’t know where the wool is from). With the exception of Gumnut Poppies (which is a wool / silk blend), all the threads are wool, and you’d think they’d all pretty much be the same, since they’re all wool, but they aren’t. And even though several of them look the same, they stitch differently. 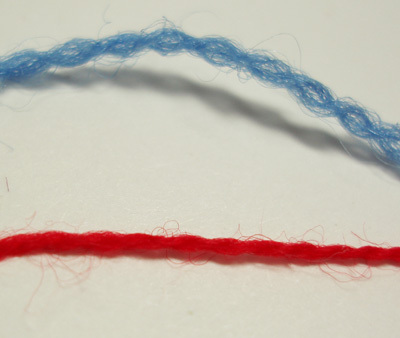 Simple Wool (lower) and Renaissance wool (top): fine, two-ply wool, kind of hairy. These two look a lot alike – they feel completely different when you stitch with them! Heathway is a two-ply merino wool, but the plies twist around each other with a closer twist – not a tighter twist than the others, because the thread isn’t tightly twisted. But the “spring” shape of the twist is definitely closer. This makes the thread a bit stretchier and springier. It also makes it very smooth when stretched out in stitching. Gumnut Poppies: The presence of silk, I think, is obvious. The strands look smoother, more lustrous, and they hold together in their twist, thick and soft. D’Aubusson’s twist is a bit shorter – it looks like Simply Wool, which has a slightly shorter twist than the Renaissance wool. But the twist is much longer than Heathway’s. Bella Lusso (lower) was difficult to photograph (red threads are always difficult to photograph, for some reason! 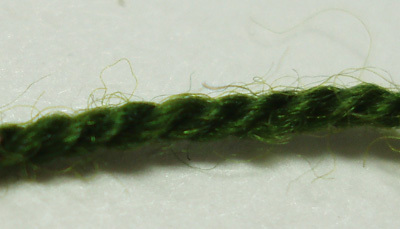 ), but you can see that its twist holds together more than the other threads – it is softer, and the fibers are longer. It reminds me more of a cotton-floche-gone-hairy than of wool. And Appleton (top) is again a two-ply twist, but notice how the plies are really separated from each other? They are long twists, but very loose, and the fibers in Appleton wool are also kind of loose and all over the place. So, although the threads (except Poppies) are all wool, and though they look alike at a glance, they have subtle differences, and these differences come across in the way they stitch. What makes them different? The way the wool is processed, the way it’s combed and spun, even the dye process, I suppose. You can read quite a bit, actually, on wool threads in general on the Renaissance Dyeing website. It’s a nice site with interesting information for those interested in wool threads, thread dyeing, vegetable dyes, and so forth. I’ll be finishing up some stitch samples to show you how these threads perform. So stay tuned for that! In the meantime, I’m planning on getting the rooster finished over the next few days! Wish me luck! This is a great idea. But how about including Paternayan wool? Do you have a sample? I can send you some if you like. Thanks for the description of the different wool available. This was a post that answered all the questions I have meaning to ask you about the ply and the textures of different wool. Your rooster project has been a great learning experience and I am waiting to see the finished piece. As a knitter, my first thought was "Of course all wool's not the same, what's she on about?" Then I remembered that non-knitters don't usually care nearly so much about sheep breeds and so on. Thanks for the valuable info on these threads. Yes, good luck strutting your stuff to finish 'our' rooster. Trust you feel ok now. I have a wool thread that I think might be Paternayan crewel weight, but I'm not sure if it is. So I didn't want to include it, and be wrong about that! Thanks, Cynthia! Concerning including the poppies, I included the wools (well, and a blend) that I used on the rooster. I would have been happy to include the other Gumnut yarns that are 100% wool, but I don't have any in my stash. I tried to contact Gumnut for samples, but they sent me to their US distributor, who, for some reason, I can't seem to get through to. So right now, I'm limited to the threads in my stash, unless I invest in some other wools, which I may do in the future. Yes, I think knitters are much more aware of the different breeds of sheep and the wool they produce. This is something I'd also like to learn a bit more about, so I've been reading up on it a bit, but don't know too much about it off the top of my head. It's obvious, though, as I read about it and work with the wools, that the wool and the process of combing, spinning, dyeing, and all that stuff have a direct influence on how well the embroidery wools work and feel, too. It's a subject I'll have to delve more deeply into in the future. Thank you, Mary, for doing this. I'm looking forward to the stitched samples and commentary. I agree with Cynthia that, if you can, including Paternayan would be good since it's so ubiquitous. 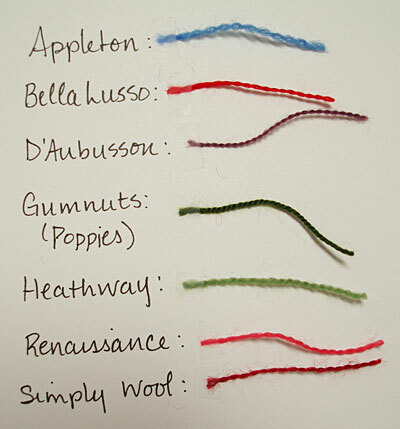 What is your top pick for wool thread? There is so much out there to choose from I figure I’ll start with your number one choice! Also, where do you buy your favorite wool thread? It depends on the type of embroidery and the look I want. I like the Fine D’Aubusson for fine, detailed wool embroidery that requires a sharp, precise line. It’s a tighter wool. For filling and a softer look, I like Renaissance Dyeing wool. Both of them are available at Hedgehog Handworks! 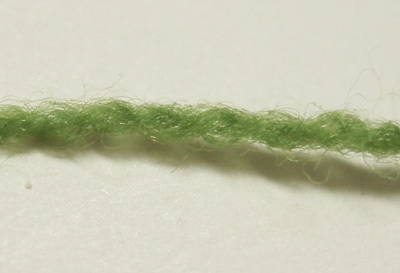 we were doing some research on crewel embroidery wool thread and found your site very informative! We like that you are conscious of where the fiber comes from because we are a wool mill in Wyoming. We are just entering the crewel thread market and are looking at what the common packaging (ie. yardage and weight) looks like for the consumers. Would you recommend any changes to what appears to be the standard 28 yards? Thank you! I have in my stash 8 skeins of DMC pure wool, I think I picked them up quite a long time ago when my 3 girls were having babies and I was into embroidering baby blankets,(something like 24 years ago!) I felt, back then, that wool was more forgiving and didnt show my imperfections as much! Do DMC still do the embroidery wool do you know? I still consider myself very much a learner with surface embroidery using cottons etc and thoroughly enjoy your daily teachings I have learned so much from from them and your site. I have a bit of allergy to wool clothing and I am wondering if the thread would make me itch… I am SO wanting to try a small project. Maybe I will just buy a bit of wool thread and try it out! Thanks for your lovely site. am desperate to find shop which sells 2 ply Appleton embroidery wool in Victoria Australia. can you help? has these ones for $2.50 each and they’re in Highgate, SA. SOOOO nice! Im trying to spin my own wool, since I can´t buy it at home. Your information and photos are SO helpful!!!! 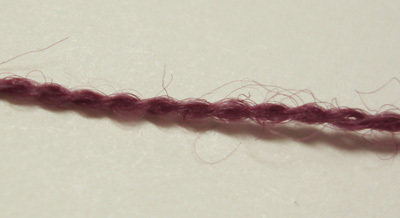 I enjoyed reading your post about the different crewel threads ( https://www.needlenthread.com/2010/01/comparison-of-wool-threads-for-crewel.html). I’ve tried to find the follow up threads to this original one and have not had any success. Are you able to send me the link to part 2? Hi, Kate – the follow up on that was pretty much the whole Crewel Rooster project, where I used different types of crewel threads on the whole project, testing them out and seeing how they stitched. Hope that helps! This may be a silly question, but can you use any wool for crewel work? I impulsively bought a lot of Anchor Tapestry wool which is the same company as Coats. It’s decent quality and wondering if I can use it for Crewel work embroidery? Do you know where I can obtain a conversion chart for Gumnuts to Appletons? I want to embroider a crewel wool bolster using a pattern from Inspirations but the cost of Gumnuts is way beyond my price range! I am curious about wool sold as tapestry. DMC Floralia Tapestry wool, is sold as 3 ply and divisible but then I read that is isn’t. I buy a lot of thread lots and yarn off Ebay because I can’t afford to buy it all from online stores and I don’t have a store near me that even sells embroidery embroidery supplies. I have purchased a lot of Medicis and have found a source for it new. What I love about embroidery is that I don’t need to follow a color chart like I do with cross stitch. I guess I would like to know about some of these other threads offered on Ebay. Can they be used for crewel? Why are some labeled needlepoint and other tapestry. I thought they were the same thing. What about Paternayan Persian yarns can these be separated and used for crewel? Now I will do some more research on the threads you have listed. I did buy the Renaissance Dyeing selection you featured at Christmas. Gumnuts is out of my price range except for a few special projects. So other than Appleton I haven’t heard of the others you have listed. Hi, Oriole – Just keep in mind that yarns that are spun for knitting are not the same as wool threads spun for embroidery. It all really depends on the type of ground fabric you’re using, how much friction will be on the thread or yarn, and so forth. I don’t know what to tell you about the yarns you find on eBay, because I can’t see them. I think Paternayan wool can be divided into three strands for crewel embroidery. Well, the old Paternayan could. I’m pretty sure it’s the case with the newer Paternayan out now. Previous Previous post: Cotton Floche: What’s Not to Love?